L. Sentius C.f. was one of the moneyers for the year 101 BC. Hes is not otherwise known, but was also Quaestor, as the Q on his coins indicate. 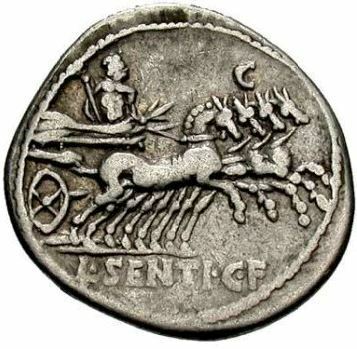 Gens Sentia was a plebeian gens, which less and less as the Republic neared its end. Their cognomini seem to have been Augurinus and Saturninus.